Intended For nasogastric introduction for aspiration of intestinal fluid or for administration of enternal nutrition. Soft rounded distal end with solid RO material sealed into the tube, to assist the passage of the tube during intubation. Marked at 500mm, 600mm & 700mm from the tip for proper placement. 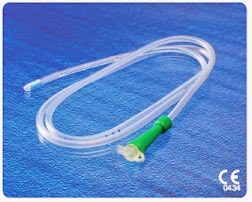 Colour coded Universal funnel shape connector with cap for easy identification of sizes provided at proximal end.